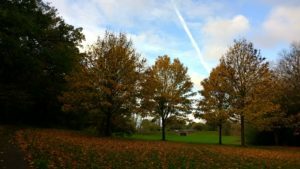 So last Wednesday (in half term) I headed out for a run first thing- it was all going well and I was enjoying the lovely autumnal day. I was around a mile from home, running through a park when I saw a large group of women with dogs going through the middle. I watched them as I carried on running on the path, when three of the dogs noticed me and raced across the field towards me. I stood still, and two of them ran back, but the third (a big dog, a bit like a greyhound but more chunky) leapt up onto me- straightaway I shouted over “can you please call your dog” and one of the women started to call, but the dog carried on jumping- it had it’s paws on my hips and was sticking it’s nose into my back. I shouted at her again to come and get it if it wouldn’t come, but the thankfully it went back to her. I was really cross- it was a big dog and it could have knocked me over. I told her that she needed to keep it on a lead if she could not control it, and she kindly told me “I can’t be up it’s arse the whole time”- I think I was very calm when I pointed out to her that all the other dogs were off leads and under control, but hers wasn’t so she was being irresponsible. None of the other women said anything but I hope that they told her that she was in the wrong (they were all walking in a big group so it looked like a sort of dog walking club or something). I totally understand that people are allowed to let their dogs off leads, and I know that dogs find people running exciting, but it’s not acceptable that a dog can jump up at someone twice and not be under control. The rest of my run was not good as I was feeling annoyed about it, and wishing I hadn’t gone into the park, and then being annoyed at myself for thinking that because (I don’t think…) the incident was not my fault. I’ve always been told to stand still (and tuck your hands in) if approached by a dog as they are more likely to chase and jump if you are moving, and so I don’t think I am being antagonistic or anything towards the dogs. Anyway, after that it was a normal day of getting some work done, as well as clearing up the leaves that are just everywhere at the moment. 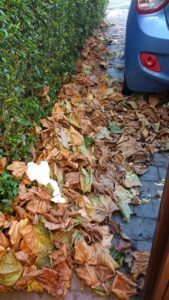 It doesn’t look that bad in the photo, but the leaves had collected all around the bottom of my car and went half way up the tyres. 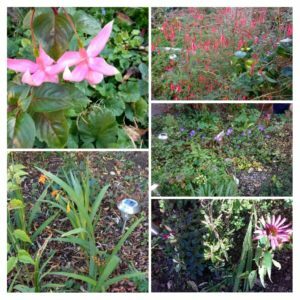 I also enjoyed looking at the flowers that are still going strong, even at this time of year. 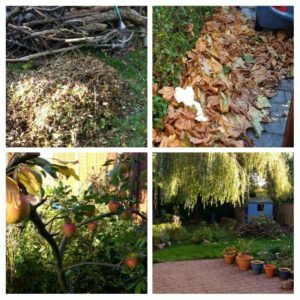 The willow tree in our back garden is shedding leaves everywhere so I did a load of raking and sweeping, and managed to fill three bags with leaves (apparently it will make good compost), fill up one compost bin and also leave a big pile on the lawn to sort at the weekend. On Thursday I had a short run before walking to the train station to go into London- Andy had a meeting so I was going to wander about a bit and then we’d have lunch together. In contrast to the lovely sunny weather of Wednesday, it was grey and damp and drizzly. I wandered around Covent Garden, amused myself watching a lady do a rather inappropriate fake striptease to a load of parents and kids (she put up a screen and was throwing clothes over the top while singing “Big Spender”)- she had certainly misjudged her audience! 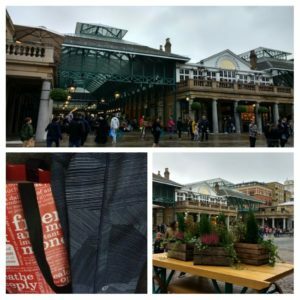 I had a delicious hazelnut hot chocolate from the Hotel Chocolat cafe (they basically heat up coconut milk and then stir in flakes of chocolate- it’s amazing) and then tried on a load of things in Lululemon. To be fair, I had a £20 voucher, but of course that doesn’t go very far! I was half looking for a top for yoga- I really don’t like a tight top, but then I really hate it when my top rides up (down?) when you are in an inversion- no-one needs to see my stomach and I know that no-one cares, but it makes me feel uncomfortable. The elastic banding around my SB top has gone loose so it’s not as good any more, but I couldn’t find anything suitable, so got some more leggings- amazingly these have pockets big enough for my phone (which is too big really, but I bought it on the internet after looking at one in a shop, not realising I was getting the newer model…)- anyway, they’ll be good for parkrun as I like being able to get my phone out quickly. After lunch at Leon we headed home and I pottered about, soaking the fruits ready for Christmas cake baking. We then went to the cinema in the evening and saw Death of Stalin, which was just so funny. A much more successful cinema trip than our recent weeks. On Friday after having our boiler serviced (I know how to live) and a walk into town, I got on with making the Christmas cakes- my favourite half term tradition. 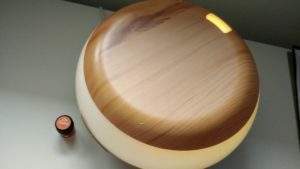 It made the house smell pretty amazing, although I’ve also been using some special oil in my diffuser at the moment, which smells pretty similar. 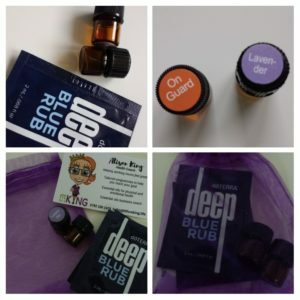 A while back a running coach contacted me and offered to send me a few doTERRA essential oils; a lavender oil, some muscle rub (which I have used after a couple of my long runs- it had a cooling effect although after the first application I learnt that less is more! ), and then On Guard, which is a blend of Wild Orange Peel, Clove Bud, Cinnamon Leaf, Cinnamon Bark, Eucalyptus Leaf, and Rosemary Leaf/Flower essential oils. It smells amazing, and apparently can be used to make mulled wine if you were inclined. I’ve just been enjoying it in my diffuser to make the room smell all festive and comforting. I was also sent some clever powder to help clean your teeth. 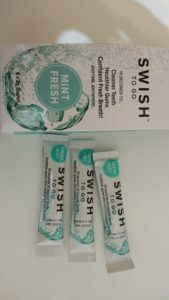 Swish to go is basically a little sachet of powder that you sprinkle into your mouth, it then turns to liquid (no need to add water), you swish it about a bit and then swallow. I have tried it a couple of times- it takes a big of getting used to as it is a weird sensation to pour onto your tongue, and the mint flavour is quite strong, but it seemed to work pretty well. Although it would not replace brushing your teeth, it would work quite well if you wanted to freshen up and couldn’t clean your teeth- for example we have parents evening straight after work, and you can’t really clean your teeth or use mouthwash in the staff toilets, so one of these would work nicely then. I’m not a big fan of eating mints because then you are left with the sugar in your mouth anyway, so these seem like a good solution. I might take one with me when I do a half marathon next month as it is nice to freshen up afterwards sometimes too. 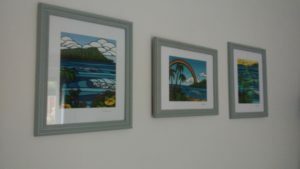 Back to the jobs- the final half term job we completed was putting up our pictures- we bought these from Hawaii and so the one on the left was from 2012- but we had not found frames that we liked until recently. They are all by an artist called Heather Brown who has just an amazing and really distinctive style (click on the link to see as my photo of course doesn’t do the art any justice)- I could have bought so many more! What are your favourite and least favourite jobs? Do you have many photos or prints on your walls? We have a Totoro print in our bedroom and a few holiday photos up in some other rooms, but we still have some walls that need filling. No you were definitely not in the wrong. That woman should have controlled her dog. I get very angry at Alfie and put him back on his lead if he does that. But actually it’s a very rare occurrence and he’s not really that sociable with other people! He just avoids everyone, even other dogs. A lone wolf. My parents dogs tho… god they’re a nightmare. They don’t jump up at people but they do bark like crazy. They’re cavaliers (and another Alfie – so a Westie cavalier cross. There are 3 of them) so they’re quite small and really quite harmless but to people uncomfortable around dogs it’s not fair. My parents just haven’t trained them. *sighs* To be fair, they rarely go on walks anyway! Very lazy. The teeth cleaner thing sounds intriguing. I got a free sample from the Bournemouth Marathon and haven’t used it yet. I love Christmas cake! I just wish I had a reason to bake one… no one in my family likes it really. Well my mum does but not with any icing or marzipan and really then what’s the point? The Hotel Chocolat hot chocolate is DIVINE. Thanks! I just hoped she realised that all the other dogs were under control- maybe? Barking is OK (apart from that dog the other week that was circling and growling)- it can make me jump but then the doorbell does that! I am not big on the icing so we keep saying I should make one where I do half with marzipan and half with marzipan and icing as I tend to pick the icing off! But it won’t look as pretty! 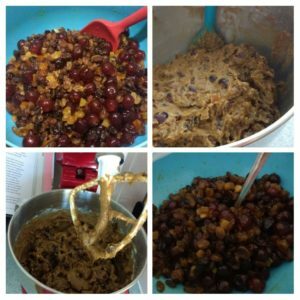 Also, the fruit cake lasts so long that you could bake one and cut it into slices and freeze (or just have it around for months probably)- then you’d have a home-made supply to last through the year. Next Next post: A long run, and afternoon tea to recover!